I’ll start with some negatives, mainly injury related. I’ve had a few problems – firstly my right thigh popped during the Rising Sun parkrun which made it difficult to walk nevermind run so a week out there and a trip to see Scott. I managed to get through that with a lot of Deep Heat and Ibruprofen only to be confronted by another problem, this time in my right glute. I rested up again but then had a difficult choice to make – 3 Peaks Fell Race, should I race or not? At the time any sudden movement or squatting was extremely painful and it didn’t show any sign of improvement whilst resting. I knew it was going to go one of 2 ways in the race – either I would be debilitated within minutes of starting and have to withdraw or the pain would dull and I’d be able to run through it. I’d already decided before I picked up the injury that I was going to take the race easy as I didn’t want to repeat the mistake I’d made at Dark Skies so I agreed to run with my mate Dave who was also racing. Luckily it was the 2nd scenario that manifested itself and whilst it was uncomfortable during the race I was able to run through it and it’s eased since. The last of my woes is also the most troublesome as I’ve had it for a number of months now and it’s not improving – my feet, especially the right one. More specifically the balls of my feet. At first they were only painful if I’d done back to back days or a long day but now they are permanently sore to the extent that I can’t walk barefoot. It’s especially painful if I’m traversing rocky terrain, and more so now that the ground is a lot drier and therefore harder. I can run through it and resting does help but I’m not giving them enough time as I’ve been in the fells every week for months now, sometimes more than once. I’ve tried a few different types of shoes and insoles, none of which has made any difference. I’m hoping that during my taper they will have enough time to heal as I scale back my training. So onto the positives, what has gone well? 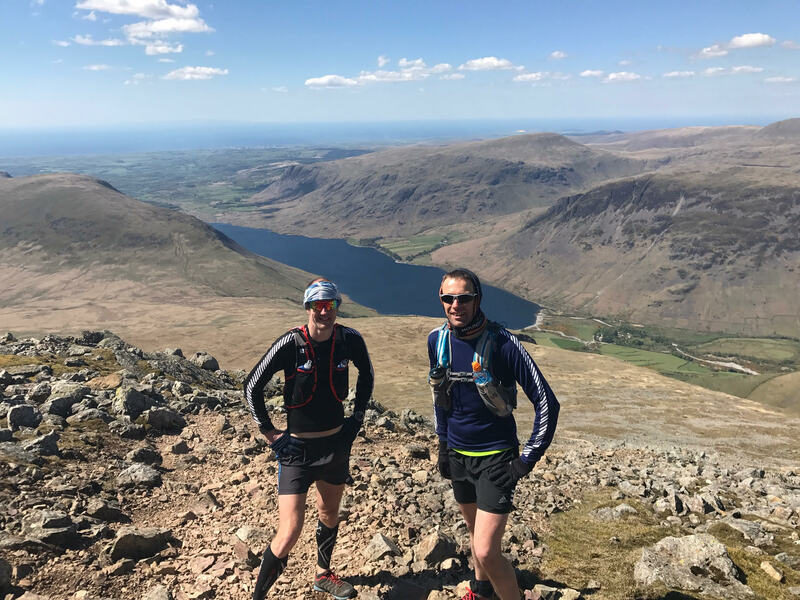 To be honest, everything else is going really well – I’ve been able to get out in the fells on a regular basis and apart from my feet I’ve been feeling good and strong most of the time. A lot of those excursions have been with Iain, and it’s been great to run together – we’ve got the same goal and so want to do the same type of sessions. Iain is in his taper now so for him all the hard training is in the bag – he’s been running fantastically well and I’m really excited for his round. I’ve got every confidence that he will succeed. I’ve got around 4 weeks left before I start my taper and on reflection it’s interesting to compare the type of training that I was expecting to do with what I have been able to achieve. I’d say the start of my BGR training was in November when I went over & did leg 4 with Iain. That was coming off the back of marathon training so I was already averaging around 50 miles a week. I’d planned to increase this, maybe peaking at 100 miles at some point. I’d also planned to regularly go to the gym to do S&C work, plenty stretching and healthy eating. None of this has happened, mainly because of the niggles I’ve had – nothing serious, but lots of little issues which have prevented me from pushing myself as hard as I normally would. On reflection this isn’t necessarily a bad thing – I’ve maintained an average of around 50 miles a week, but increased the proportion of these miles in the fells. The rest of my running has been easy shorter runs with no speed work or hard sessions. This has meant that I’ve not overtrained and don’t feel as tired and jaded as I sometimes have when I’ve been marathon training. I’d still like to do more S&C in the remaining time I have though. One thing that both myself and Iain have done is to increase the length of the days we are spending out in the fells. When we started we’d typically do a 4/5 hour run. 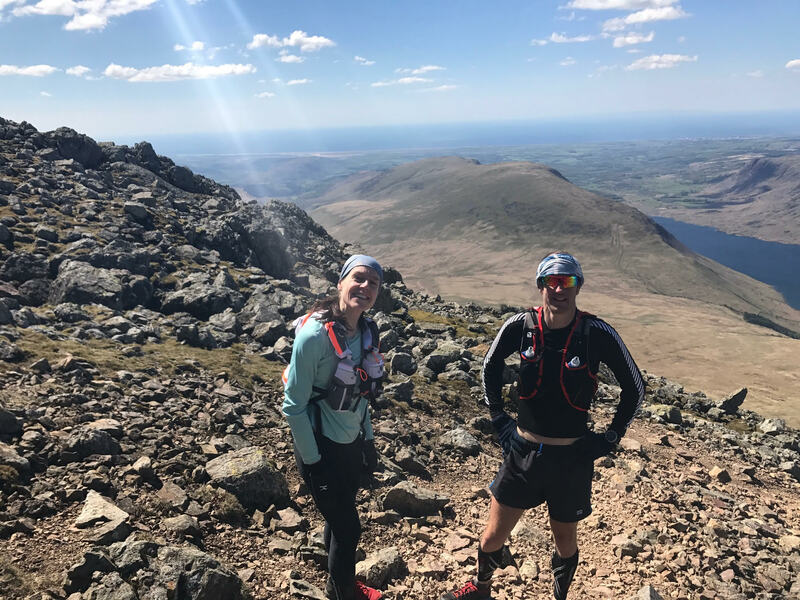 Lately we’ve increased this up to 7,8 and most recently a 10 hour day also with Gemma in which we covered 24 miles and 11,000ft of ascent on legs 3 and 4 (the most technical and difficult part of the round). I’ve also done multiple back to back days– my longest week being 75 miles and around 21,000ft of ascent. These later sessions have given me a lot of confidence as although I’ve felt more tired than on the shorter days I’ve still felt reasonably strong and never felt wiped out at the end of the day. The back to back sessions have also been good to experience running on tired legs. 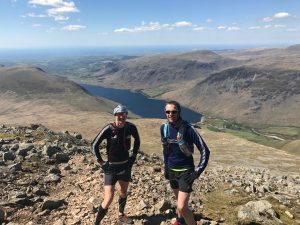 I’m certainly not being complacent though – I know that on the day I’m going to have to run more than twice as far and cover more than twice the ascent than I have in any of my sessions. I’m also conscious that I’m going to be sleep deprived and will be spend a significant amount of time running in the dark. All in all though things are positive and I’m really looking forward to the big day!